Here at Electric Gates Direct we have been manufacturing and installing high quality fully automated/electric commercial gates throughout the UK for many years. We can build gates to your own specification or you can choose from one of many designs of which can be altered if necessary to suit your needs, click on the following link for examples (Commercial Gates). Any of our gate designs can be made as a pair or a single to swing. Also sliding gates are very popular either tracked or cantilever. We can manufacture our sliding gates to look like a pair if you require, take a look at the examples and you may be surprised how good they actually look (Commercial Sliding Gate Examples). Electric cantilever sliding gates are by far the most popular in our sliding gate range. Our sliding gates are MADE TO MEASURE and manufactured in house with no restriction to the length or height. Without the need of an unsightly track in the floor the unique cantilever system delivers maximum security whist maintaining the pleasing aesthetics. Electric cantilever sliding gates are also the better option when it comes to security. 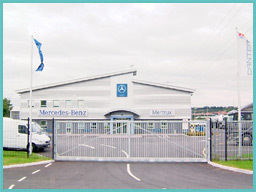 We have manufactured and fitted commercial gates for many large commercial concerns such as Mertrux (Mercedes Benz/Mitsubishi), Romo Fabrics, Toray Textiles, Bunches Florapost, Node 4 Ltd, Bowmans Transport, Mitchells Transport, Taylors Transport, Wilkinsons, Renualt Trucks, Layland Daf Lorries and many more! 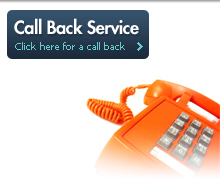 We encourage our customers to come and view the process of our products being manufactured if they wish before committing to any order, this way you can appreciate the time, effort and quality that goes into our products setting us aside from our competition. With over 20 years experience manufacturing our commercial gates they are made to the highest standards using only the best quality materials. An example of a heavy duty commercial cantilever sliding gate would be: Main framework 120mm Box-section with 25mm Box-section infill along with diagonal bracing, these gates can be made up to 15 metres in length! We also can add different infills to match existing fencing you may have such as mesh, pallisade, pallidin etc. 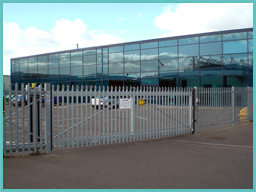 Our commercial metal gates are also finished to the highest standard using first a hot dipped galvanizing process, followed by a mordant solution/t-wash pre etching process and finally finishing the products with a top coat colour of your choice, although most commercial gate customers choose just to have them galvanized ONLY. This not only enhances the appearance of our products but ensures the longevity of their life and reduces ongoing maintenance.